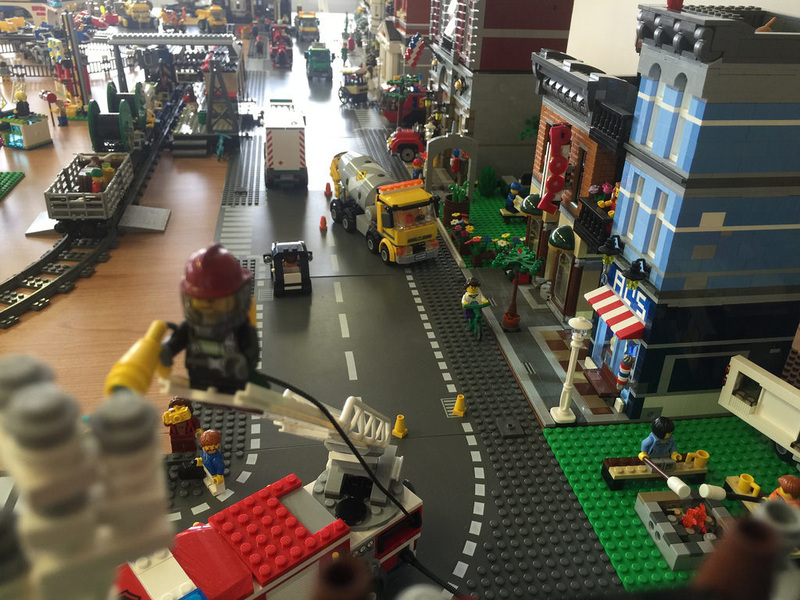 Last week I was able to create and show off my first big LEGO display, and over the last two days I’ve been talking about my process. On Friday I looked at choosing the theme, scale and sets and working with others, while yesterday I looked at the layout and MOCs. Today, I’ll be wrapping up the whole process with transport, setting up, and final touches! For me, transport was relatively simple, as the display was all separate plates or sets. The only part I moved together were the two 32×32 demolition zone plates, but again, it was pretty simple. I placed all the vehicles in a big box (including the folded up Mixer), with some of the smaller plates on top, and the modulars just in the car loose in the back. Nothing moved, or got destroyed, so I was fairly relieved! If you are creating a big MOC, it does pay to factor in the movement of it – can it be easily taken apart? It will make for a much easier transportation day! Once all the tables were together, I thought “There’s no way I’m going to need all this room!”. Little did I know just how big it would be! The first thing I set up were of course the road baseplates. This would form the skeleton of the display. I clipped them all together with some matching dark stone grey plates of various sizes – basically whatever I could find in my spares collection. Once they were together, the next step was the modulars and parks. 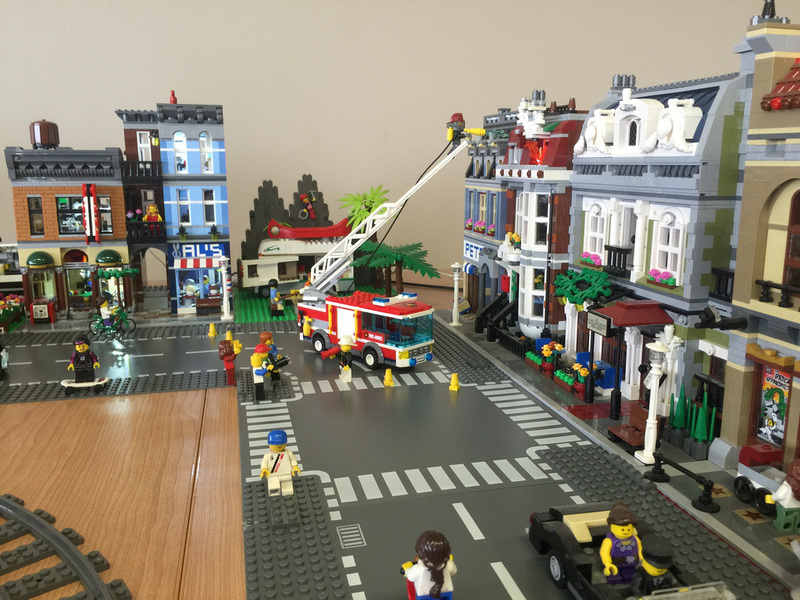 I knew where I wanted to put them – the Grand Emporium and Cinema on a corner block, and the firehouse on a corner with a side street for the Airport Fire Engine, and the rest just filled the gaps. I originally wanted a park next to the Town Hall, but with the Cement Mixer coming with one of them, there wasn’t enough room on that half of the display. 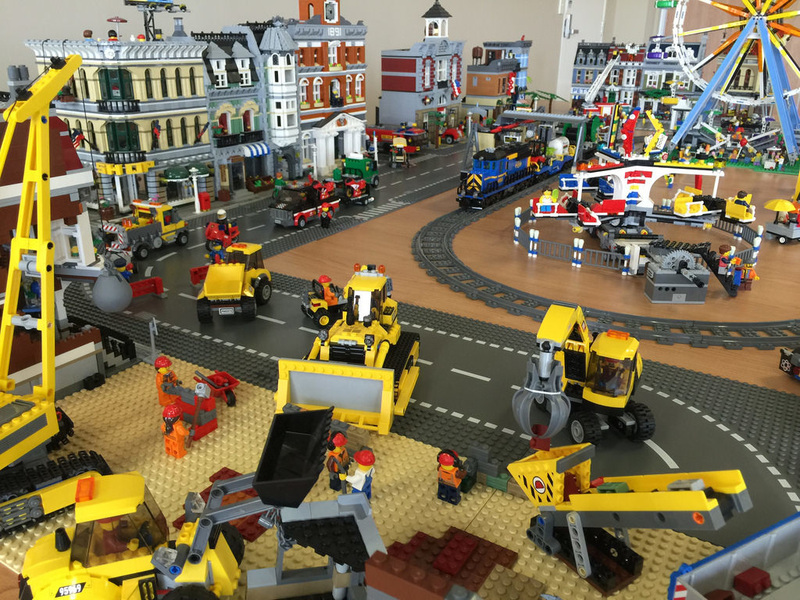 Once the modulars and parks were in place, I laid the train tracks and stations. After that, it was time to move the fairground in. The Ferris Wheel was a simple drop in, but the Mixer had a bit more of organisation to do, as well as where I wanted the sideshow alley booths. 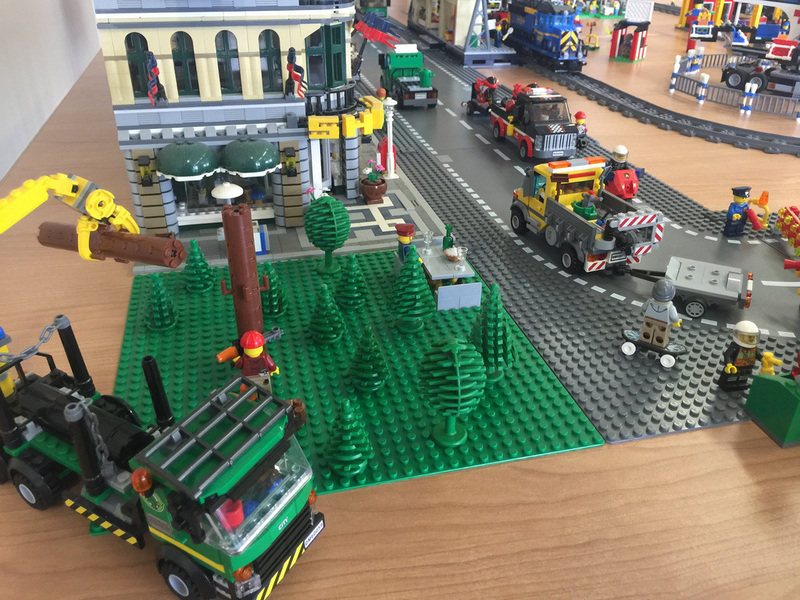 Once the fairground was set up, the next step was the little details – the vehicles and minifigures. The demolition zone was a little more time consuming than I thought – I hadn’t set it up with the extra room of the roads, so that was something I did on the fly. The Fire Truck and Cement Mixer were in first, then the rest of the vehicles, followed by the assorted minifigures I found. More costumed minifigures were added to the fairground (as well as a couple walking around town for fun), and spectators added to the front of the building on fire. Some of the spur of the moment touches were the Star Wars minifigures lining up for a movie, and the bin on fire next to Pop’s. These were all elements I found in my workmate’s box – I thought I’d put them to good use! I was a little puzzled as to what to do with the extra sidewalk (on the road plates). I figured I’d use these as a bike path. I’m glad I did as it would have been a very cramped sidewalk if I had planned ahead and built the modulars onto the road plates. It also takes a whole lot of work! I also added a criminal jumping the fence after robbing an ATM next to the town hall, with a policeman on a motorbike chasing after him. It was simple, but effective. The last thing was to add some lights. I only had enough for a few buildings, so I lit up the Detective’s Office, brownstone on fire, and the Cinema foyer. As the lights were white, I built a very simple light box from transparent red plates to give it a red glow and put it near the fire. it gave off the perfect amount of light. I’d love to get it to flicker a little, but I didn’t have the right set up. I was really happy with the set up. I’m not sure what I’d change next time. I’m pretty limited for parts, but I’d love to embellish the demolition zone more. Maybe more buildings or rubble. I’d love to have a big tree somewhere too. My little one was far too small! That’s it! If you’ve created a display before, I’d love to hear from you! How did you do it? Where was it? If you have photos, send them through and I can do a response entry! To finish, I’d like to thank a few people – Steve for the roads, Cathy for the modulars, my wife for putting up with me working on this every night, and all the people that came and had a look! The response was so much better than I thought. It was a great week! 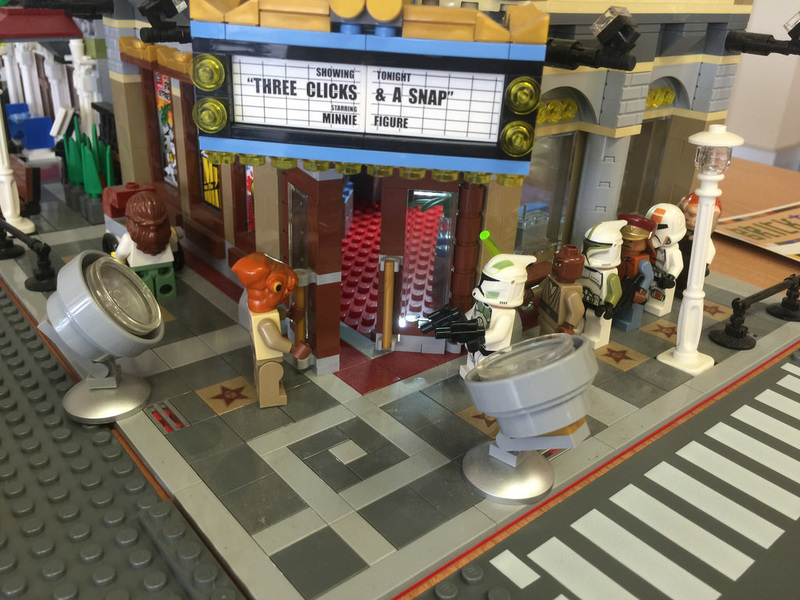 As always, I’ve created a Flickr album for the display on the BricktasticBlog account, so if you want to have a look at more images, they are all there. I’ve also created one for the MOCs I created for the display. Enjoy!